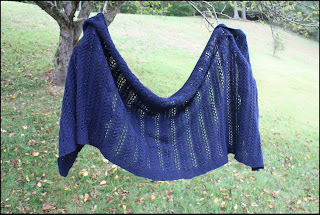 I finally got the Kilkenny cable shawl outside for it's photography session. It has been so hot that I didn't want to touch wool while in the heat. 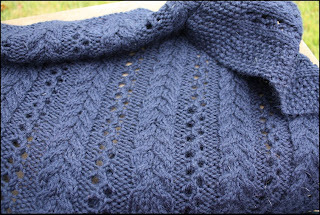 Pattern: The pattern is from Folk Shawls by Cheryl Oberly. 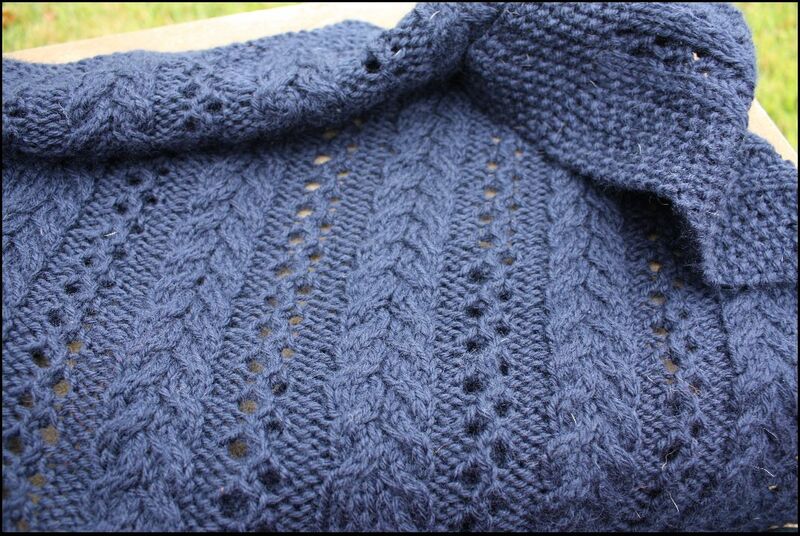 It's a great pattern -- the name is Kilkenny Cable Shawl. It is, as you can see in the image, a rectangular shawl, and it is knit across its length -- from one long edge to the other. In other words, there are many stitches on the long circular needle at once. There are published errors. 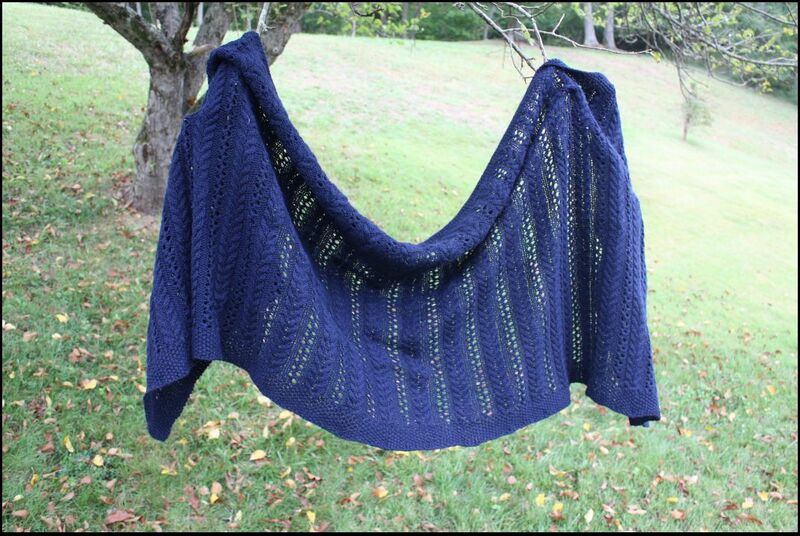 Yarn: The shawl is knit in Knitpicks Wool of the Andes, in colorway Blue Ink (which they don't carry anymore). I used 15 skeins of the yarn. I disappointed that Knitpicks no longer carries Blue Ink. It's a great, deep navy, and I'll miss it. The images in this post don't show how dark the blue is -- the sun was too bright to get a good color rendering of the blue. This picture is probably closer to it's deep blue color. Needles: I knit this using Knitpicks Harmony circular needles, US size 7. Finished project: After I blocked the shawl, the size was 31 inches by 74 inches. 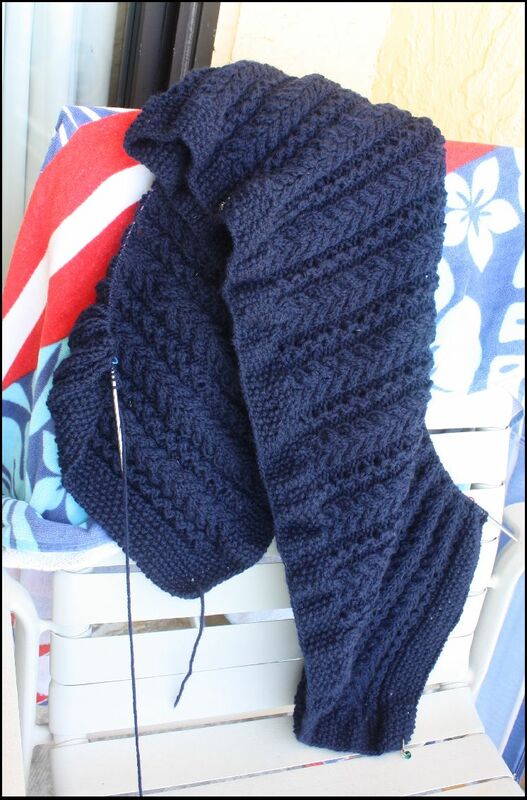 I started the project at the beginning of February and finished it at the end of July, but that's probably not indicative of the amount of time it takes to knit it -- I didn't knit on the shawl continuously; there were periods of non-knitting.